Our ability to run, bicycle, ski, swim, and row hinges on the capacity of the body to extract energy from ingested food. As potential fuel sources, the carbohydrate, fat, and protein in the foods that you eat follow different metabolic paths in the body, but they all ultimately yield water, carbon dioxide, and a chemical energy called adenosine triphosphate (ATP). Think of ATP molecules as high-energy compounds or batteries that store energy. Anytime you need energy—to breathe, to tie your shoes, or to cycle 100 miles (160 km)—your body uses ATP molecules. ATP, in fact, is the only molecule able to provide energy to muscle fibers to power muscle contractions. Creatine phosphate (CP), like ATP, is also stored in small amounts within cells. It’s another high-energy compound that can be rapidly mobilized to help fuel short, explosive efforts. To sustain physical activity, however, cells must constantly replenish both CP and ATP. Our daily food choices resupply the potential energy, or fuel, that the body requires to continue to function normally. This energy takes three forms: carbohydrate, fat, and protein. 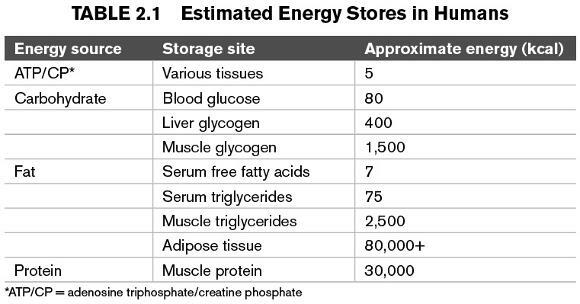 (See table 2.1, Estimated Energy Stores in Humans.) The body can store some of these fuels in a form that offers muscles an immediate source of energy. Carbohydrates, such as sugar and starch, for example, are readily broken down into glucose, the body’s principal energy source. Glucose can be used immediately as fuel, or can be sent to the liver and muscles and stored as glycogen. During exercise, muscle glycogen is converted back into glucose, which only the muscle fibers can use as fuel. The liver converts its glycogen back into glucose, too; however, it’s released directly into the bloodstream to maintain your blood sugar (blood glucose) level. During exercise, your muscles pick up some of this glucose and use it in addition to their own private glycogen stores. Blood glucose also serves as the most significant source of energy for the brain, both at rest and during exercise. The body constantly uses and replenishes its glycogen stores. The carbohydrate content of your diet and the type and amount of training that you undertake influence the size of your glycogen stores. The capacity of your body to store muscle and liver glycogen, however, is limited to approximately 1,800 to 2,000 calories worth of energy, or enough fuel for 90 to 120 minutes of continuous, vigorous activity. If you’ve ever hit the wall while exercising, you know what muscle glycogen depletion feels like. As we exercise, our muscle glycogen reserves continually decease, and blood glucose plays an increasingly greater role in meeting the body’s energy demands. To keep up with this greatly elevated demand for glucose, liver glycogen stores become rapidly depleted. When the liver is out of glycogen, you’ll “bonk” as your blood glucose level dips too low, and the resulting hypoglycemia (low blood sugar) will further slow you down. Foods that you eat or drink during exercise that supply carbohydrate can help delay the depletion of muscle glycogen and prevent hypoglycemia. Fat is the body’s most concentrated source of energy, providing more than twice as much potential energy as carbohydrate or protein (9 calories per gram versus 4 calories each per gram). During exercise, stored fat in the body (in the form of triglycerides in adipose or fat tissue) is broken down into fatty acids. These fatty acids are transported through the blood to muscles for fuel. This process occurs relatively slowly as compared with the mobilization of carbohydrate for fuel. Fat is also stored within muscle fibers, where it can be more easily accessed during exercise. Unlike your glycogen stores, which are limited, body fat is a virtually unlimited source of energy for athletes. Even those who are lean and mean have enough fat stored in muscle fibers and fat cells to supply up to 100,000 calories—enough for over 100 hours of marathon running! Fat is a more efficient fuel per unit of weight than carbohydrate. Carbohydrate must be stored along with water. Our weight would double if we stored the same amount of energy as glycogen (plus the water that glycogen holds) that we store as body fat. Most of us have sufficient energy stores of fat (adipose tissue or body fat), plus the body readily converts and stores excess calories from any source (fat, carbohydrate, or protein) as body fat. In order for fat to fuel exercise, however, sufficient oxygen must be simultaneously consumed. The second part of this chapter briefly explains how pace or intensity, as well as the length of time that you exercise, affects the body’s ability to use fat as fuel. As for protein, our bodies don’t maintain official reserves for use as fuel. Rather, protein is used to build, maintain, and repair body tissues, as well as to synthesize important enzymes and hormones. Under ordinary circumstances, protein meets only 5 percent of the body’s energy needs. In some situations, however, such as when we eat too few calories daily or not enough carbohydrate, as well as during latter stages of endurance exercise, when glycogen reserves are depleted, skeletal muscle is broken down and used as fuel. This sacrifice is necessary to access certain amino acids (the building blocks of protein) that can be converted into glucose. Remember, your brain also needs a constant, steady supply of glucose to function optimally. Carbohydrate, protein, and fat each play distinct roles in fueling exercise. Provides a highly efficient source of fuel—Because the body requires less oxygen to burn carbohydrate as compared to protein or fat, carbohydrate is considered the body’s most efficient fuel source. Carbohydrate is increasingly vital during high-intensity exercise when the body cannot process enough oxygen to meet its needs. Keeps the brain and nervous system functioning—When blood glucose runs low, you become irritable, disoriented, and lethargic, and you may be incapable of concentrating or performing even simple tasks. Aids the metabolism of fat—To burn fat effectively, your body must break down a certain amount of carbohydrate. Because carbohydrate stores are limited compared to the body’s fat reserves, consuming a diet inadequate in carbohydrate essentially limits fat metabolism. Preserves lean protein (muscle) mass—Consuming adequate carbohydrate spares the body from using protein (from muscles, internal organs, or one’s diet) as an energy source. Dietary protein is much better utilized to build, maintain, and repair body tissues, as well as to synthesize hormones, enzymes, and neurotransmitters. Provides a concentrated source of energy—Fat provides more than twice the potential energy that protein and carbohydrate do (9 calories per gram of fat versus 4 calories per gram of carbohydrate or protein). Helps fuel low- to moderate-intensity activity—At rest and during exercise performed at or below 65 percent of aerobic capacity, fat contributes 50 percent or more of the fuel that muscles need. Aids endurance by sparing glycogen reserves—Generally, as the duration or time spent exercising increases, intensity decreases (and more oxygen is available to cells), and fat is the more important fuel source. Stored carbohydrate (muscle and liver glycogen) are subsequently used at a slower rate, thereby delaying the onset of fatigue and prolonging the activity. Provides energy in late stages of prolonged exercise—When muscle glycogen stores fall, as commonly occurs in the latter stages of endurance activities, the body breaks down amino acids found in skeletal muscle protein into glucose to supply up to 15 percent of the energy needed. Provides energy when daily diet is inadequate in total calories or carbohydrate—In this situation, the body is forced to rely on protein to meet its energy needs, leading to the breakdown of lean muscle mass. 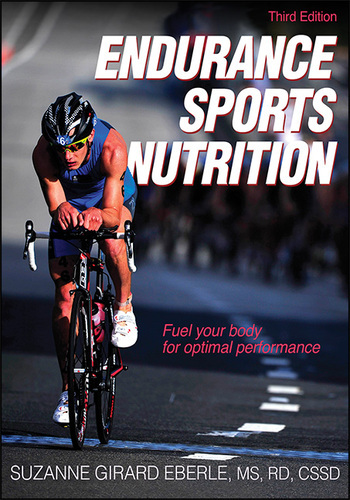 This excerpt is from the book, Endurance Sports Nutrition-3rd Edition. It’s published with permission of Human Kinetics. Please purchase this book from Human Kinetics. The following is an excerpt from The Runner’s Edge, regarding pacing and is with the permission of Human Kinetics. “While it’s obvious that a speed and distance device can be used for monitoring and controlling your pace during races, you need to use your device somewhat differently in races of different distances, and you must avoid succumbing to the temptation to rely on it too heavily. First, before you race, try to get a good sense of your device’s specific degree of accuracy. Most devices are inaccurate by a consistent degree in one direction—either too long or too short. Test your device on measured courses whenever possible to determine its pattern. Races themselves afford some of the best opportunities, but be aware that it’s actually normal to run approximately 0.5 percent too far on certified road race courses because these courses are measured by the shortest possible distance a runner could cover in completing it (that is, by running every turn and tangent perfectly), and nobody ever does that. If your device model has an option to display the average pace for the current lap or run, set the display in this mode before the race starts. If you’re running a 5K, ignore your watch for the first several hundred yards, when it’s crowded and your main priority is to find a rhythm. Once you have found your rhythm, take a quick glance at your average pace. It almost certainly will not match your target pace for the first mile, but that doesn’t mean you have to actively speed up or slow down. Just absorb the number you see, think about it in relation to how you feel, and let your gut tell you how to adjust. Sometimes this early quick glance can save the day. When adrenaline gets the better of you and you start way too fast, it gives you the chance to rein in your legs and save your race before it’s too late. If you waited until the first mile split to discover your mistake, it would be too late. On the other hand, if you start way too slowly, the quick glance at your average pace may remind you that, in fact, you are not working as hard as you could be, and you have an opportunity to speed up before you’ve dug too deep a hole to climb out of. But most often that early, quick glance will merely confirm that you’re more or less on pace. When running 10K races, do the same early glance at your average pace as soon as you’ve settled into a rhythm and adjust, if necessary. After that point, ignore your device (but pay attention to your mile splits) until the second half of the race, during which you should check the device whenever you find yourself worrying that fatigue is causing you to slip off your goal pace. The benefit of doing this is that it almost always motivates you to run harder, no matter whether the display tells you that you’re right on pace, have fallen a second or two per mile behind pace, or are ahead of pace. The only circumstance in which it’s likely to be demoralizing is when you’re having a bad race and have fallen far behind your target pace. In these circumstances, you’re going to end up demoralized anyway. Half marathons are long enough that your mile split times become almost meaningless after you’ve run several miles and brain fatigue has crippled your mathematical faculties. So don’t even bother paying attention to your splits after 10K. Instead, glance at your average pace at each mile mark to check whether you’re still on track toward your goal. As in 10K races, this type of monitoring is likely to keep a fire under you—there’s just something about chasing numbers that makes us work harder! In the marathon, all measures taken to control your pacing with objective data go out the window after the halfway mark. You have to run by feel. But properly controlling your pace with objective data in the first half is critical to setting yourself up for success in the second half. The marathon distance is just too long for your anticipatory regulation mechanism to make reliable decisions about how fast you ought to be running in the early miles. Instead, rely on setting an appropriate time goal and target pace and check your speed and distance device as often as necessary to ensure that you stay on this pace through the first half.